The interior designer confesses that this apartment was quite challenging for her: with a total area of just 40 square meters and north-facing windows, it had to be made comfortable for a middle-aged single man, non-cluttered and well-lit. 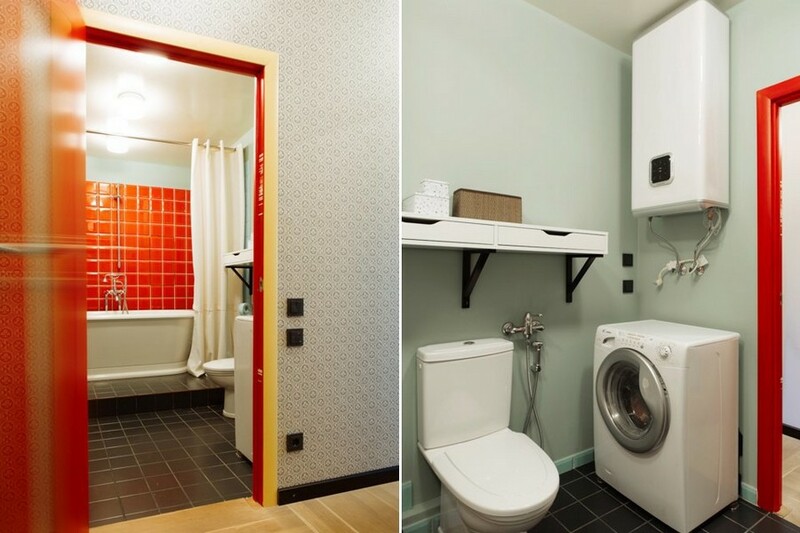 To accomplish all of these tasks, the designer paid special attention to competent zoning of the apartment and its color scheme. 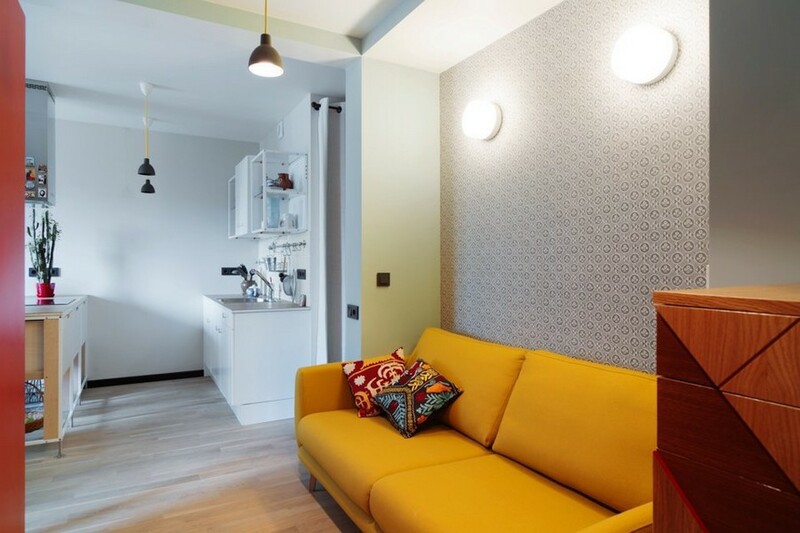 Thanks to a plasterboard partition and a kitchen island she managed to split the flat into four functional zones: lounge, bedroom, kitchen and work. 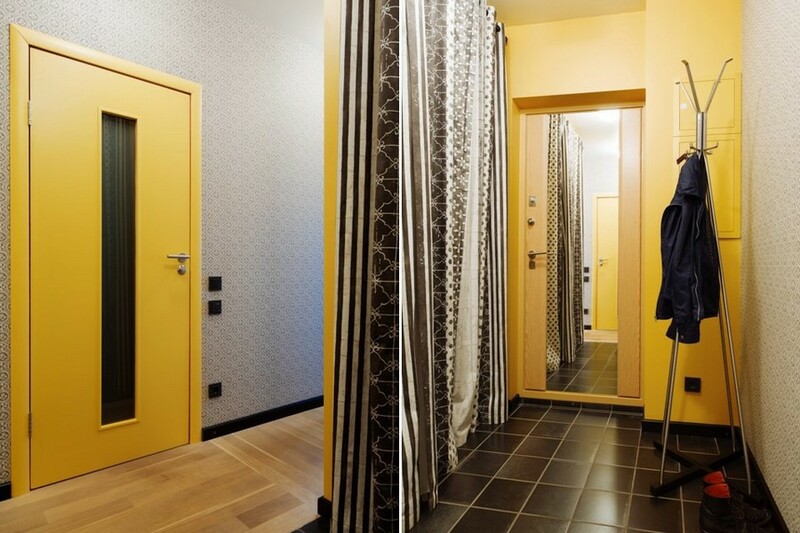 Not to overload the space, customary doors were abandoned in favor of common light curtains. 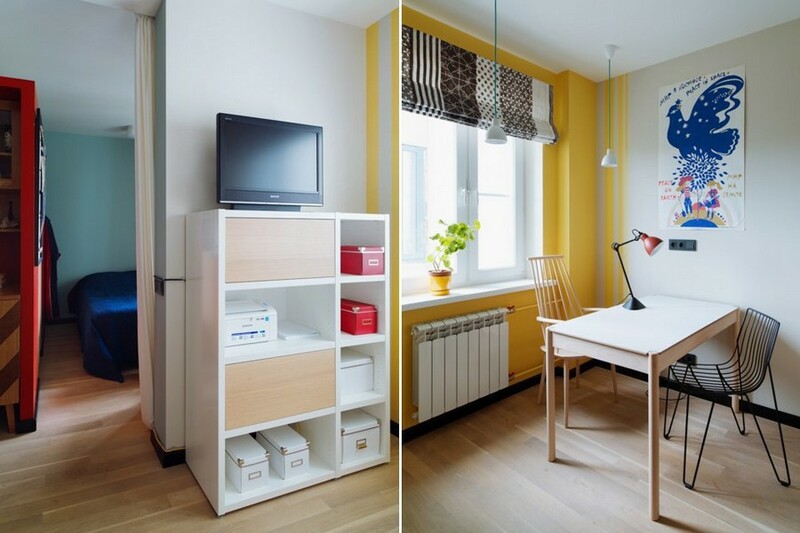 Though it’s not quite typical of condo interiors, the interior designer believes that the internal environment of the house must be linked to its exterior. The face of the house, on the seventh floor of which the client lives, is blue. So, pale aquamarine was picked as the dominating wall color. It’s complemented by deep red, which is the favorite color of the master, and yellow, that’s supposed to add the sense of coziness to the north-facing space. Such a color palette was able to expand the room visually and make it seem deeper and three-dimensional. And some black details brought a finishing note of contrast and graphics. The flooring is made of natural oak parquet boards. 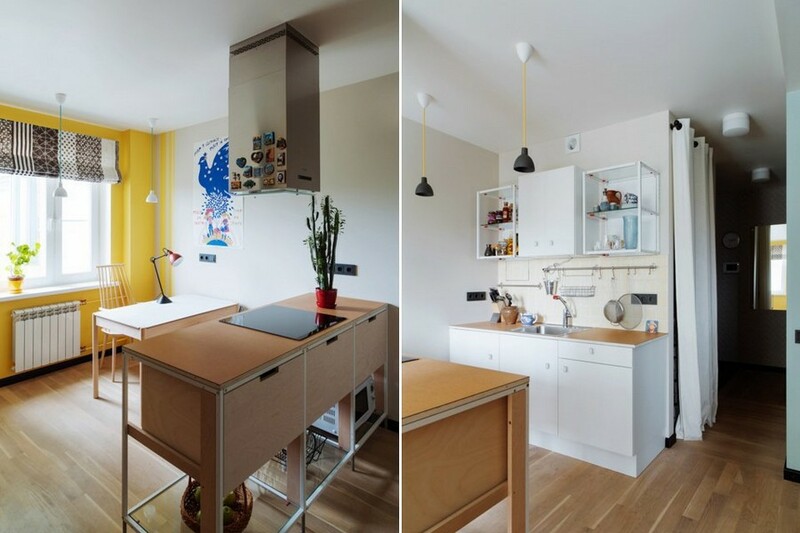 The kitchen set is comprised of expensive Italian elements (Valcucine, Meccanica model) and common IKEA cabinets. This helped to stay within the budget not at the expense of aesthetical attractiveness. The laconic dining set is made by a Scandinavian Hay brand. 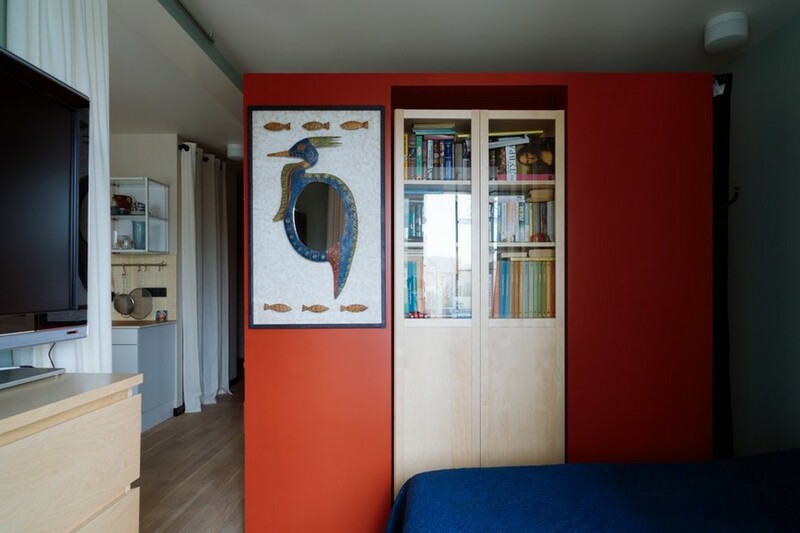 The red plasterboard structure features a few storage recesses: from the bedroom side it has a built-in bookstand by IKEA, from the wall side there is a small wardrobe, from the kitchen side there is compact cupboard and in the lounge it will be equipped with a sound system. A wooden chest of drawers with geometrically carved doors and a cheerful yellow sofa in the lounge zone are made by BoConcept. 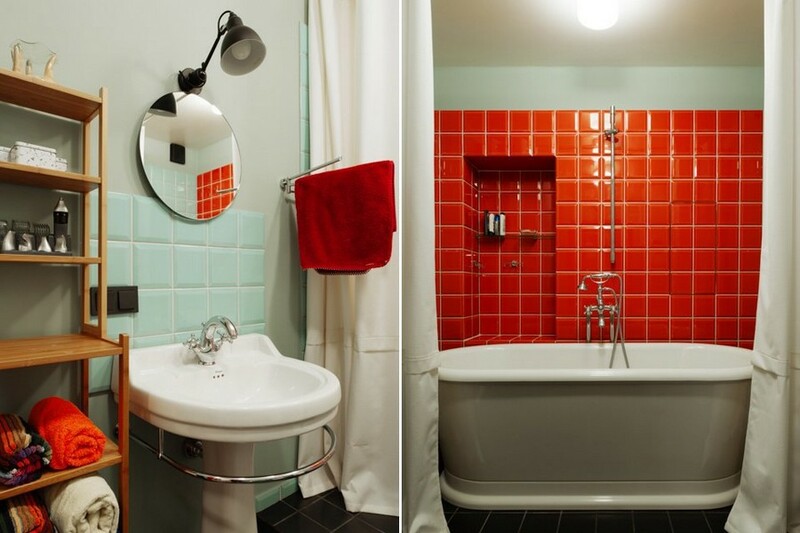 And surprisingly enough, the bathroom interior looks nobler than the rest of the apartment: it’s faced with Italian tiles and equipped with English sanitary porcelain and fixtures.